SPUR Talk: What About the Families? 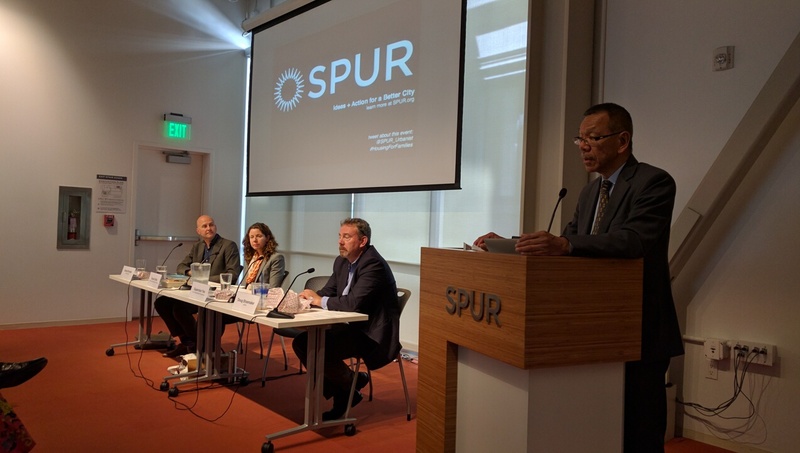 Daniel Parolek, Susan Exline, Doug Shoemaker, and SF Supervisor Norman Yee discuss urban housing that is suitable for families. Image: Streetsblog. How can San Francisco keep families from moving away? 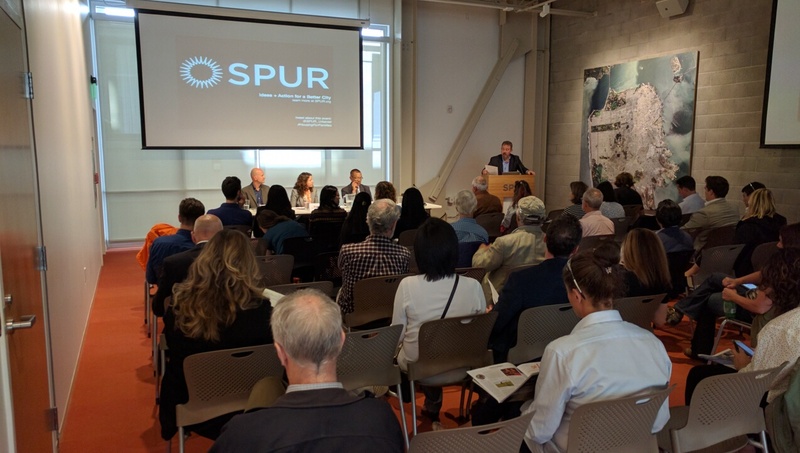 That was the central question of a panel discussion this afternoon hosted by the San Francisco Bay Area Planning and Urban Research Association (SPUR). The panel included Susan Exline of the San Francisco Planning Department, Daniel Parolek, architect with Opticos Design, and San Francisco’s District Seven Supervisor Norman Yee. The panel was lead by SPUR Board Member Doug Shoemaker. Supervisor Yee spoke first, pointing out that San Francisco has the lowest child population of any American city–around 13 percent, while most American cities are at 25 percent and some are at 35 percent. Yee, a former SF School Board member who raised two daughters in Westwood Park, said he’s long asked why developers fail to produce more family-oriented housing. He said it’s great that there’s so much focus on affordable housing, but “Why are we losing all these children?” he asked. Yee pointed out that the city is focused on developing dense high rises but doesn’t imagine that families can be accommodated in them. “Almost all developers said we know how to build family housing, we build it in other cities… city leadership has said we don’t need family housing here. I’m sorry, but we need to change the discussion,” Yee said. He has been pressing developers to include child care centers in their plans. “I started quizzing them: what else do you think families want? Is it just three bedrooms? If I were a parent, I don’t want to be on the 50th floor without a view of a playground [for my kids]. Daniel Parolek and his firm Opticos developed this illustration of “Missing Middle” housing that is most suitable for families. “Yee asked us at Planning to start by writing a white paper about how to make [urban] housing for families,” said Exline. Several panelists described the current situation: generally, young people move into San Francisco, but most–once they have children–move right back out. And that damages the entire city fabric. “Having kids in a city helps the rest of the city thrive as well. There’s a long list of things families need to stay in the city,” said Exline. She mentioned parks, walkable streets, safe crossings and intersections, and safe bicycle paths. She pointed out these are the same things that make a city safer and more livable for all road users–including seniors and the disabled. “Having kids in a city helps the rest of the city thrive.” The white paper she’s developing will start posing questions about just what people need to raise kids in the city, especially as millennials reach the typical child rearing age. “The current population by age–the biggest number is 20-32-year-olds. So are they going to stay in the city? There is research that they have preferences to stay in the city.” But the city keeps producing more studio and one-bedroom apartments, she said–which are too small for families. Exline said other cities have been successful in keeping families in downtown areas. She cited Vancouver, British Columbia, where one-third of the population consists of families. She said promoting family-friendly housing can be looked at from three perspectives: at the site level, where you’re dealing with things such as access to schools and childcare, through transit, car sharing, parking, and bike storage. On the granular level, that could translate into mandates that housing accommodate a certain amount of cargo-bike storage. Then there’s building and lot scale. That might mean designing a courtyard apartment building so the three-bedroom apartments face into an inner courtyard with a playground, “built so you can see your kids outside playing,” she said. Then she introduced the concept of “middle housing,” meaning townhouses, duplexes, and other structures that, while still dense, are more suitable to raising families than high rises. Daniel Parolek of Opticos picked it up from there, with a presentation on “Missing Middle Housing.” He talked about how “density” is one of many words that tends to frighten away support, because it conjures up images of behemoth apartment blocks. But, he said, in times past communities knew how to build dense housing that was family-oriented with a residential feel. 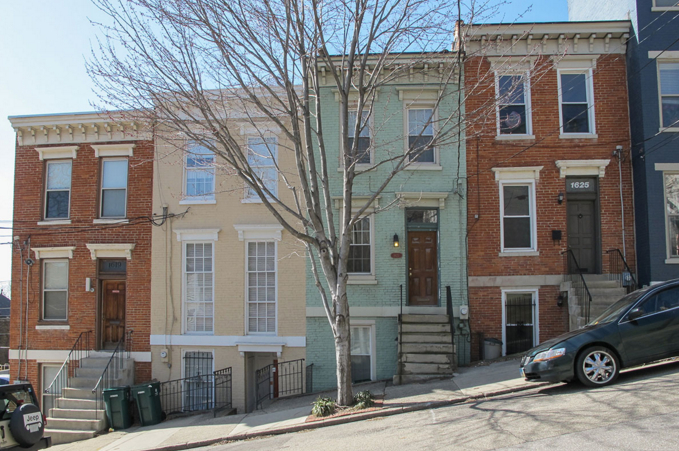 Flexibility and this kind of dense duplex and townhome housing can be difficult to build under today’s zoning rules. Image: Opticos. Yee, meanwhile, feels his own life is representative of a changing San Francisco. “Last week I became a grandfather. That gives me even more motivation to help define what family housing is… a second grandkid is coming in October,” he said, emphasizing that for the whole city, as with himself, “They [more kids] are coming quickly.” And San Francisco has to get ready. SPURs hosted a panel on the challenges of planning for families today. Photo: Streetsblog. Denying the existence of racism in America is racist. You are racist because you deny the existence of racism. Jim, I never denied the existence of racism. What I said was that not every allegation of racism is valid, and that it is not racist to question an allegation of racism and subject it to rational scrutiny. You seem to think that even suggesting that an allegation of racism may be false is itself racism. Nonsense. Not for a survey of schoolchildren they don’t. Facts are what they are.